The ruthless, systematic transport of Jews from Austria, Czechoslovakia and Germany began on October 15, 1941. The organization of the transports reflected the critical mid-September change in Hitler’s thinking, namely, that deportation of the German Jews could proceed while the war was going on, although it was still hoped that war would end by fall 1941. As a corollary, emigration to lands offering refuge was prohibited. The Litzmannstadt Ghetto had existed since early 1940: written instructions had been issued in early December 1939 and registration for evacuation had begun on December 13, 1939. In February 1940, about 160,000 Jews, more than one-third of Lodz’s population, were forced into the ghetto. The living conditions in the ghetto were atrocious, as most of the area did not have running water or a sewer system. The immediate effect was a death rate of around 20 percent of the ghetto’s population. Given its prewar importance as an industrial centre, Lodz remained a major production centre under German occupation. The ghetto itself became an industrial site: by May 1940, factories had been set up to produce many different war materiel, such as German army uniforms. Ghetto residents were forced labourers. Mordechai Chaim Rumkowski, Chair of the Ghetto Jewish Council/Judenrat, hoped that productivity in the ghetto would help prevent the deportation of those living there. Between October 15 and November 3, 1941, twenty (20) transports from Austria (Vienna), Czechoslovakia (Prague), and Germany, carried 20,000 Jews to Litzmannstadt Ghetto. 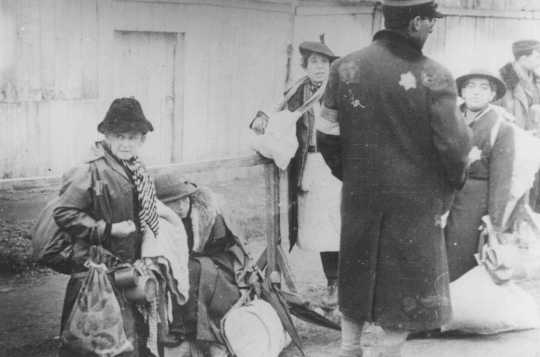 In addition, approximately 20,000 Polish Jews were forced into the ghetto from the surrounding towns and villages, and approximately 5,000 Roma from Austria were deported to Lodz. 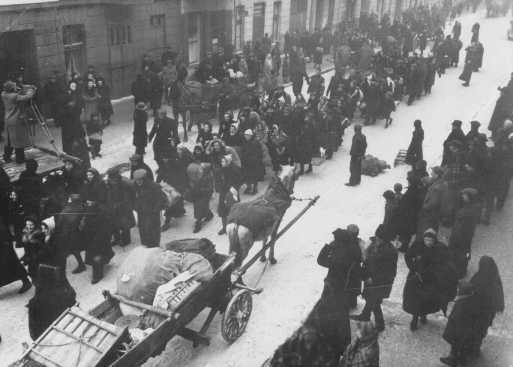 Most of the Jews deported to the ghetto were elderly men and women, and many did not survive the difficult winter. By the end of April 1942, 3,186 people, 16% of the non-Polish Jews, had died. The oldest group in the ghetto was from Berlin, and 27% of them died in this period. Furthermore, most of these people had been unable to find work in the ghetto, as they had been declared incapable to work by the Nazis upon their arrival. Anyone who tried to escape the ghetto was murdered in front of the other prisoners. 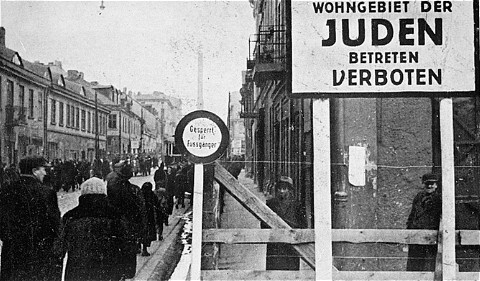 The arrival of the Jews from Germany, Austria, and Bohemia introduced enormous tension at all levels into ghetto existence. Dawid Sierakowiak wrote in his diary: “On the one hand, I’m beset by fear of deportation to Germany; on the other hand, I’m afraid that I won’t get a job after the German Jews arrive.” But the traditional, and familiar, tensions between Jews of western and eastern Jews — social, linguistic, religious, cultural, political — did not disappear with the stresses of this collective experience. In the ghetto environment, resentment and mistrust flourished encouraged by the German authorities. Accommodation for the German Jews, for example, was prepared by evicting Polish Jews and forcing them to move into the already overcrowded homes of other families.When this proved insufficient, schools were closed and other public buildings were converted into more living quarters for the German Jews. The food supply to the ghetto was not increased and the Polish Jews had to share their rations with the German Jews. Polish Jews spoke Yiddish; German Jews most often spoke German. The one source of tension — over jobs — may have been allayed by the fact that the Nazis declared many of the German Jews incapable of work. Eva Friedmann, Yad Vashem Page of Testimony. Two members of Themar’s Jewish community were deported to Litzmannstadt Ghetto in 1941 — in fact, they were on the very first transport of Jews from a German site. On 16 October 1941, Hugo and Eva Kahn Friedmann were deported from Trier to Litzmannstadt. Hugo was a religious leader/Lehrer and had accepted a position in Themar in the first decade of the 20th century. Four children — Johanna, Sitta, Friedrich and Hugo — were born there. We know that Eva and Hugo were in Ettelbruck, Luxembourg during the first months of WWII; there were about 3,800 Jews in Luxembourg at that time. 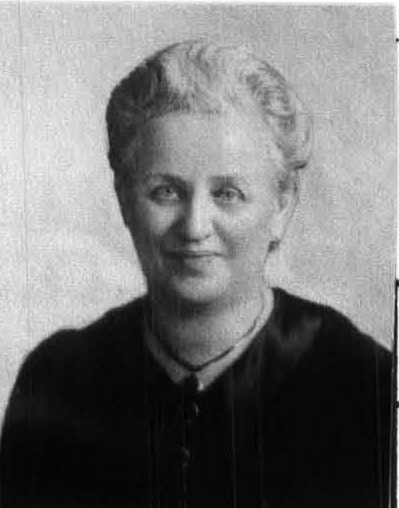 For Eva, who was born in Medernach, Luxembourg, she was returning home; perhaps the Friedmanns hoped that they would find refuge there as Luxembourg had more or less maintained its neutrality in WWI. That was not to be: on 10 May 1940, the German army occupied Luxembourg as it swept its way south in France. It was close to a bloodless conquest in that one militia-man and six Gendarmes were wounded, but no one was reportedly killed. On 28 June 1940, Luxembourg was formally attached to Germany as part of the Gau Koblenz-Trier regions. Initially, the German administration continued to allow emigration and the Jewish population took advantage of this, dropping to 1,800 by mid-1941. But Hugo and Eva were unable to emigrate: on 16 October 1941, the first transport from German soil left from Trier-Bernkastel. Hugo and Eva Kahn both died in the Ghetto, Eva in May 1942 and Hugo in June 1942. He was 66 years of age, Eva was 64. Of their children, Sitta Friedmann, her husband, Ernst, and 9-year old son Joachim were murdered. We believe that Johanna, Friedrich and Hugo all survived. 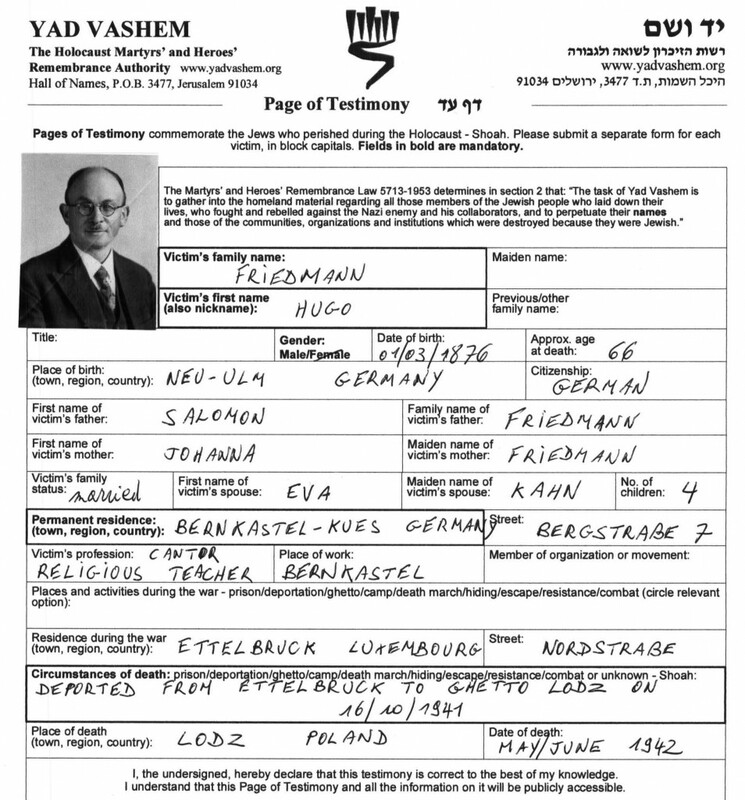 Yad Vashem Page of Testimony for Hugo Friedmann submitted by grandson in 2008. Barkai, Avraham, “German-Speaking Jews in Eastern European Ghettos,” Leo Baeck Institute Yearbook (1989) 34(1): pp. 247-266. Mosel, Wilhelm, “Hamburg Deportation Transport to Litzmannstadt (Lodz)” Hamburg Deportation Transports. Witte, Peter, “Two Decisions Concerning the ‘Final Solution to the Jewish Question’: Deportations to Lodz and Mass Murder in Chelmno,” Holocaust & Genocide Studies (1995) 9 (3): 318-345.